Ask these questions to yourself! Are you able to comfortably raise your arms above the head? Is sleeping on the side causing you a lot of pain? Is your stiff shoulder limiting your upper body mobility? If the answers to these questions are yes, then you should consider chiropractic care. Dr. Allen Conrad, the chiropractor at Montgomery County Chiropractor Center, has attended several patients complaining about the painful conditions mentioned above. In his time as a chiropractor, he has helped these people overcome their pain and degenerative conditions by using non-invasive treatment techniques. Among the biggest reasons for this type of shoulder pain is an injury to the rotator cuff. The shoulder joint of our body is surrounded by a group of tendons and muscles that make the rotator cuff and provide movement and stability to the shoulder. Most of the cases of shoulder pain happen due to injury to the tendons in the rotator cuff, but sometimes even the muscles are involved. It is imperative to learn the cause of these injuries to find the appropriate treatment option. This is where Dr. Allen Conrad will help you. With his experience in the field, his understanding of symptoms and their relation to specific underlying conditions, and the availability of latest diagnosis tools – he will be able to precisely diagnose the cause of the pain and suggest a chiropractic technique that will work best to provide pain relief and accelerate recovery. Dr. Conrad will use his experience in the field of chiropractic care to address the causes of your pain. 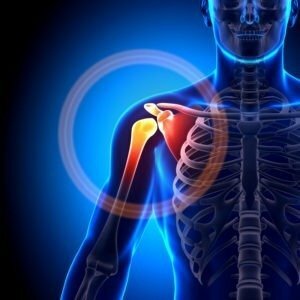 We have many non-surgical techniques available with us, including electrical muscle stimulation, gentle strengthening & stretching exercises, and massage therapy, to help you regain the ability to move your shoulder without pain. Dr. Conrad makes sure that your shoulder doesn’t lose its strength or flexibility by incorporating range of motion and therapeutic exercises into your shoulder careplan. By working on your strength, movement, and flexibility, the treatment doesn’t allow the injury or pain to reoccur. This is why our rotator cuff pain chiropractor, Dr. Conrad promote holistic healing – reducing the possibilities of stiffness, loss of strength, or immobilization.